If you normally catch up with the latest news in your own language, think about changing this and reading the news in English. There are many online editions of newspapers in English such as The Guardian and The Independent. It might also be useful to check out their travel pages to find travel-related vocabulary. You never know, there might be an article on your destination! Also, if you’re thinking about buying a travel guide, why not buy one in English as this will give you the most relevant vocabulary to your destination. A personal favourite is Time Out, a travel guide in English which also has a website. It features many major worldwide destinations. Watching any video source will help you improve your English quickly by helping you hear what the words also sound like. If you don’t have such a good level of English start with the subtitles on and once you become more familiar with the vocabulary you might feel confident enough to turn them off. YouTube is a great resource for finding travel videos and videos related to your destination plus they are also a lot shorter than a movie so you can always find the time to watch one or two a day. There are many websites such as Interpals, where you can now find an online pen-pal who is learning your language. You normally write in the language you wish to learn and the person who writes back is learning your language and you can correct them if you wish. This gives you practise of writing in English and seeing where your mistakes are. To completely surround yourself with the English language is perhaps one of the most effective ways to subconsciously absorb new words and new information. What does this mean? Well, as well as reading in English and watching English videos you could also listen to an English radio station and change the language settings of any devices you use. This could be considered an immersive technique too. Everything that you need and use at home, you are most likely to use on holiday too. You might feel silly labelling your table, chair or window, but if you are still struggling with some basic vocabulary or certain things to do with the house then labelling them is a good idea if you want to learn English. If you already know a lot of this English vocabulary, why not attach small sentences, or questions to some of your appliances. For example you might need to report problems such as ‘the light is not working’, ‘the water is cold’ etc. This is an effective learning method as you will learn to associate items and sounds with words. 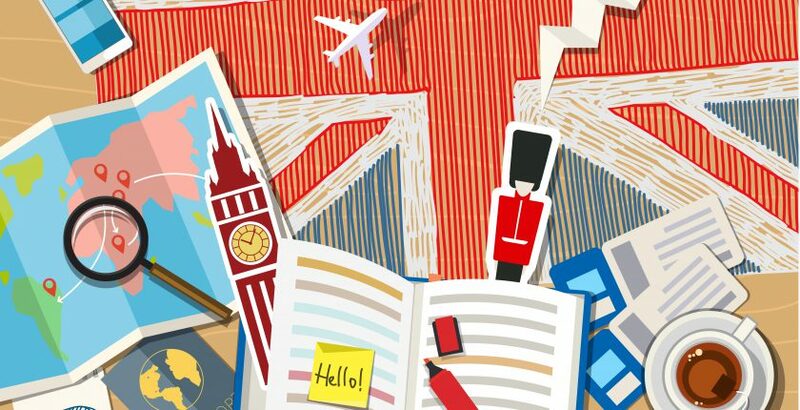 We hoped that you enjoyed these tips on how to learn English quickly in time for a trip. Which of our suggestions do you use and what advice would you give someone else? Please let us know in the comments below, we would love to hear from you. If you’re planning on going away, you might also like to read our travel-inspired English idioms.